Want a signed copy of Erin’s books but can’t make it to an event? Simply order online through Gibson’s Bookstore! Erin will visit the store to personalize/sign your copy and then Gibson’s will mail it directly to you! There’s no extra cost for a signed edition–it’s the same as ordering an unsigned copy online (just the list price + $3.50 shipping fee). During checkout, look for the “Order Comments” field at the bottom of the page. Mention that you would like a signed copy here. If you want the book personalized as well, include the name it should be addressed to. This follow-up to Taken...retains plenty of the action and suspense that readers appreciate. Late developments hold great promise for more excitement and drama in the third episode. The strengths of this series are in the dystopian world and survival aspects. 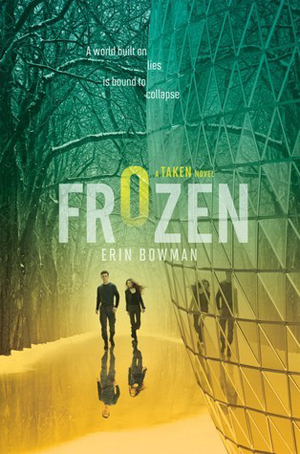 Frozen will attract most readers of science fiction—especially those looking for a male lead. A surfeit of enemies and a constant sense of danger heighten the suspense; it’s an almost grueling read.